In the past few weeks, I've hardly written a thing. The Great God Pan Is Dead is my blog, but only one of the past seven posts has been mine. I started a post in January on Prospect 3 in New Orleans but didn't get too far. A friend of mine noticed this, but generally it has been unremarked. Which I would expect. I'm not so vain to imagine that people miss my writing here. These excuses would explain diminished output--but not silence. The fact is, while I could have been writing (and attending openings and looking at art), I've been filling up my time in less productive ways. I've caught up on my television (Marvel's Agents of Shield is completely stupid but highly entertaining). I've drawn a lot; little more than doodling, really. Nothing that anyone but me needs to see. But it's pleasurable, and it has reminded me that drawing as an untheorized activity has a high value. And I've read a lot. That's part of the problem. Since the beginning of the year, I've read 24 books. Eleven of these have been books of comics which generally require less of a time commitment than prose books. So let's say 13 books. Not to mention the New Yorker, the Brooklyn Rail and various online publications and blogs. 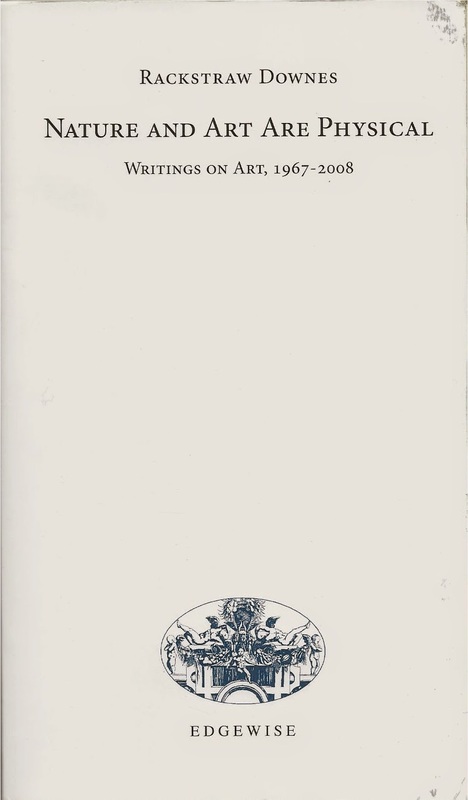 Right now, I'm reading Nature and Art are Physical: Writings on Art, 1967-2008 by Rackstraw Downes. Downes is a painter whose work I don't dislike, but in which I have only a little interest. I don't even know why I bought the book. Maybe it was the unusually modest but extremely handsome format--it's like a blank mass-market paperback untouched by an art director. And I totally judge books by their covers. Downes wrote for ARTnews, Art in America, The New Criterion, Bomb and other publications. His writing is often epigrammatic. (The long preface by John Elderfield is irritating because it quotes so many of Downes' best lines that the reader is about to read for himself. It's like serving the dessert first.) Writing about Charles Burchfield in 1970, he drops this line: "But although the vanguard is presumed to march in the name of freedom and originality, to some artists its revolutions tend to look distinctly like the palace variety, with built in exclusions as rigid as those of the academic whipping-boy it presupposes." Downes is a brilliant defender of a reactionary aesthetic. And by "brilliant," I mean he is an unusually good writer--the sentence above is a perfect example. He employs humor "the palace variety" and inverts the revolutionary program of modernism. He points out that modernism was invented in the name of freedom from the stultifying conventions of academic painting but had at some point become increasingly rigid and puritanical. And even though we can say we are in a post-modern period, our revolutions still seem to be "of the palace variety." Regardless of how social "social practice" art is, for example, the only people who concern themselves much with it enough to read books about it are art insiders like me. Downes managed to make me think differently. It wasn't a drastic change; let's just say it made me appreciate Neil Welliver a little more and Barnett Newman a little less. And that's nothing to sneeze at! But more important to me as a committed hedonist was that reading Nature and Art Are Physical was pleasurable. Downes comes out of a literary background--he studied literature before switching to art. This shines through both in his elegant writing style and his erudite use of literary examples as well as artistic examples to explain his arguments. I like that he can easily analogize between different art forms--it's something I sometimes do in my own writing, but never as effectively as Downes does. For example, he wrote an article about Claude Lorrain. He quoted the great English landscape artist John Constable on Claude, an artist who Constable revered: "Claude's exhilaration and light departed from him when he was between 50 and 60, and then he became a professor of the 'higher walks of art' . . . so difficult it is to be natural." Then Downes recalls that Paul Valéry, in comparing the poet's means to the composer's suggests that a poet uses the constantly shifting and evolving substance of human speech while a composer uses a set of specific sounds, "counted and classified," that are quite distinct from noise. (Keep in mind that Valéry was writing this 100 years ago or so). So, "if the nature painter, who tries to respond directly to whatever is in view, might be said to resemble the poet in Valéry's comparison, Claude increasingly resembles the composer. 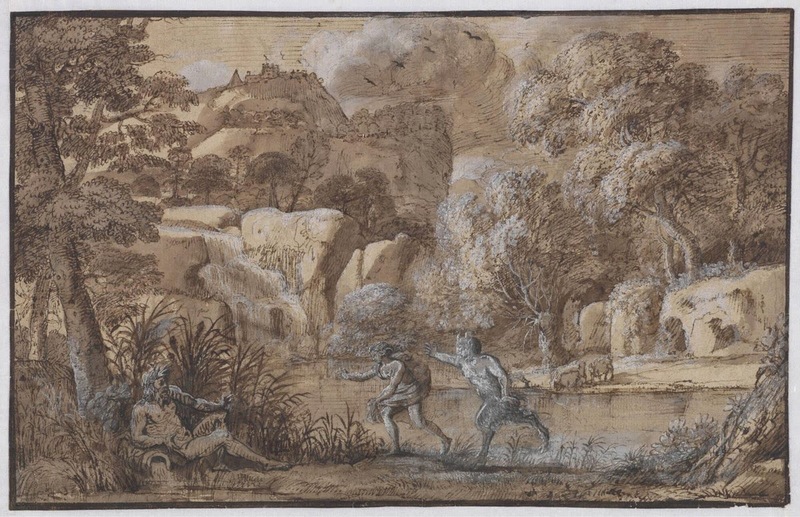 His drawing expeditions to the Campagna decreased sharply after the age of 50 . . ." Claude's later works were constructed by looking at elements of his earlier work. What I love about this small section in a longer piece about Claude is the effortless way Downes brings together three artists (Claude, Constable and Valéry) and three art forms (painting, music and poetry) into a tight and perceptive critical insight. Likewise, Downes' essay "Henri Rousseau and the Idea of the Naïve" was a revelation because he connects naïve art (i.e., "outsider" art--the shifting nomenclature of this kind of art was noted by Gary Fine in his book Everyday Genius) to Schiller's essay "Naïve and Sentimental Poetry," where Schiller compares poets who seek nature with poets who are nature. Given that this is a subject of long interest to me (since the 80s when I first saw work by Henry Darger and Adolf Wölflli), I found Downes' long meditation on the subject eye-opening and fresh--or as fresh as a German essay from 1795 can be. But this, not surprisingly, is typical of Downes. He writes in "What the Sixties Meant to Me" that the Hegelian or Marxist idea of dialectical progress was a category error in Modernist theory, and that artists often make their personal breakthroughs by looking into the past instead of the future. I think you can see the problem here. I'd rather be reading Rackstraw Downes than writing my own reviews. I've heard writing teachers complain that their students don't read enough. That seems counterintuitive to me, since it is reading that has long fed my desire to write. But right now, it is inhibiting that desire. I read something great and it makes me think, why bother? What does my writing add to the world that this thing I'm reading now doesn't already do so much better? And if my motivation for writing is personal satisfaction (or, as I prefer to think of it, pleasure), what if I get more pleasure from something else--like reading other people's work? And when you go beyond behind art writing--a very narrow genre--the potential for pleasure increases exponentially. After, art writing is writing in service of something else. It isn't written in order to be art. If it achieves that, it's kind of a miracle. Now I want to express a value judgment here. I'm not attempting to define a universal truth--this is a very personal and subjective opinion: novels are the best form of art. They just are. 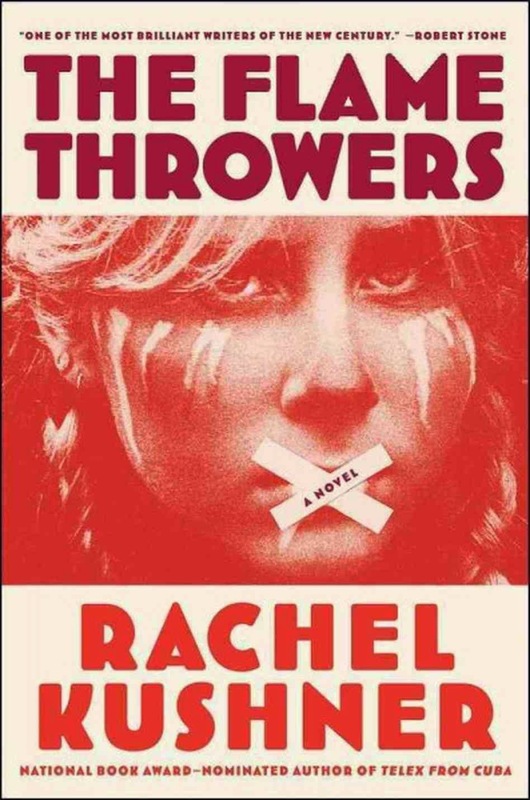 I love all kinds of art, but none has given the intellectual engagement and pleasure that novels have over the course of my life, from the first novels I read (probably the Oz books of L. Frank Baum) to the last novel I read, The Flamethrowers by Rachel Kushner. The Flamethrowers starts off in a very Hemmingway-esque mode--indeed, there are two equally Hemingway-esque stories being told in alternating chapters. In one, a young woman picks up a motorcycle in Reno and drives it out to the Bonneville Salt Flats, where she attempts a personal speed record. The other story follows an Italian motorcycle soldier in World War I under attack by Germans. This beginning made me think it was going to be a certain kind of novel. I had expectations. It's OK to have expectations and have them filled--generally speaking, that's something I approve of in art. It means I wasn't let down, and frankly that's usually enough. But The Flamethrowers pulled the rug out from under me. We never know the protagonist's name--she is called Reno by some of her acquaintances, which fits in with the initial feeling that we might be reading a novel by a hard-boiled descendent of Hemmingway. But instead, the novel sprawls out in unexpected directions, in the art scene of New York in the early to mid 70s; in the radical political scene of the Lower East Side in the late 60s; to the "years of lead" in Italy. Reno is inserted into an art world that for those of us familiar with the history (and the mythology) of the era will recognize. Certain characters and locations are obviously analogs of actual people and places. And these parts of the novel felt like a true representation of what it was like to be an artist. I don't know if an artist from that period would agree, but the thing is that Kushner convinced me. I am friends on Goodreads and Facebook with someone I've never met but who is married to an old colleague of mine. I hope Peter Landau won't mind me quoting his Goodreads review: "[The Flamethrowers] explores the incendiary actions of artists, the mythologies they create and the damage such creations leave in their wake. [...] I couldn't help but compare and contrast, whether right or wrong, this successful novel with a less successful autobiography I recently read that treads similar themes within the same time and place." I think the book he's talking about is probably Just Kids by Patti Smith, and The Flamethrowers reminds you what a superb writer can do (as opposed to someone who is a really good writer for a rock star). But again I felt discouraged. Here was a book that was so intricate and harsh that I could never in a lifetime ever hope to match it. She was not engaging in "art writing" like Rackstraw Downes, but she said more about art in The Flamethrowers than I have in writing this blog for five years. Or maybe this is just me feeling down on myself. A few days back, Ta-Nehisi Coates wrote a beautiful tribute to David Carr, the recently deceased New York Times journalist and author of the harrowing The Night of the Gun . Carr had hired Coates for his first reporting job to at the Washington City Paper. Coates talks about Carr's mentorship and his philosophy of journalism--that a story could be about a big subject, but it needs narrative to drive it forward. Oh, I know and Coates knows that Carr didn't invent this. One can think of Willie Morris's Harpers, or many of the best writers for the New Yorker or Esquire. But Coates learned it from Carr and it obviously informs Coates' writing. The reason I mention it is there is something bloodless about writing a review. Maybe if I was meaner, it'd be more fun. But stories--that's where the real fun is. I think my best posts have been basically first-person narratives: for instance, "The Show is So Over" and "Searching for Forrest Bess." What I've concluded is that I don't want to write reviews anymore. So what this means is that the focus of this blog will change somewhat. Posts may get a little longer. They will definitely more based in narrative. I think this may be the way to rekindle my interest in The Great God Pan Is Dead. Of course, there will probably continue to be reviews by this blogs other contributors. See for example Paul Mullen's review of Mel Chin's show at the Contemporary Art Museum. I hope we'll see many more posts as thoughtful as that one was. But my own writing henceforward will be a little different. i like your writing when your doing like investigate journalism on art topics related to Texas, the anthropology of the houston art scene its up commers ,dead beats and forgotten famed of the 70's.